Well my journey to the world of only MAC is now ... well nearly complete. 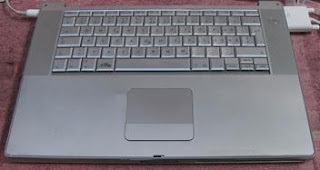 On Saturday night i spotted a Powerbook g4 laptop for sale on Trademe. It didn't have a screen, this was perfect as i was looking for a cheap mac mini or similar to run as the file server backup server for the macs we have. I was lucky enough to win, as a very reasonable $275. Once it showed up the first thing to do was install leopard so I could take advantage of Leopards TimeMachine backups and the TimeCapsule I have. This was more troublesome than I though it was going to be. Since it didn't have a screen and I was using an external monitor. Everything the Leopard install started it treated it as a two monitor setup with the main dialog boxes for the install showing on the missing screen which was there and I couldnt continue with the install. After a lot of Google searches and finding nothing I decide to try this. I am now in the process of making this the file server and backup server. I now have all my data on a external drive attached to the headless powerbook, this is then backed up via TimeMachine to the TimeCapsule, this covers any local disk failures. I have also joined Mozy and the whole machine is also (well starting to be will take a while to upload 160GB) backup up to the "cloud"
This covers local drive failure of the external drive / laptop and the online backup covers fire/theft... natural disasters. The data that is backed up is mainly digital photos, artwork and documents. I have decided at this stage not to upload my itunes music. I will wait to make sure I get all the other data uploaded first. That 160Gb is only my data, I have to also do my wifes data which is another 200GB. But for $5 a month per device / umlimited space is cheap piece of mind. 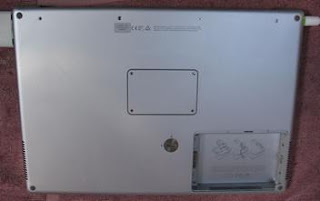 So here are some shots of the old/new wonder headless lappy. Video Card: ATI Mobility Radeon 9700 with 64 MB of DDR SDRAM. Optical Drive: 8X "Combo Drive" capable of reading DVD at 8X, writing CD-R at 24X, writing CD-RW at 16X, and reading CD-ROM at 24X.